England were magnificent as they cruised to a 169-run victory over tourists Australia with a full day's play in hand. New head coach Trevor Bayliss was in charge of his first Ashes Test match and will be ecstatic at his side's performance after dominating Australia on both sides of the ball. The match, which took place at Cardiff's SWALEC Stadium, was comfortable for England and has instantly dismissed any suggestions that Australia would earn their second successive Ashes series whitewash. Joe Root was instrumental for the hosts, scoring 134 runs in the first innings, 60 in the second and taking two wickets as Australia desperately looked to stay in the contest. England haven't lost an Ashes series on home soil since 2001 and have made the perfect start in the latest edition of the game's greatest rivalry. 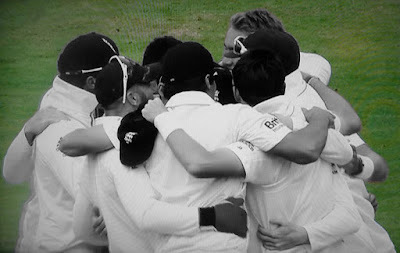 At the time of writing, England are priced at evens with betfair to go on and lift the Ashes this summer and if they can maintain such high intensity, they will stand a great chance. We've recapped the main events throughout play and consider the key performances that secured a maiden victory for Australian-born Bayliss as England's head coach. England won the toss and captain Alistair Cook elected to bat but the hosts didn't get off to a great start. Yorkshire's Adam Lyth, playing in his first Ashes Test match, was out after scoring just six runs. In no time, Cook and the struggling Ian Bell had also lost their wickets and England were teetering on 43-3. However, Gary Ballance and the in-form Root dug deep to start a spirited fightback. Root, who was dropped by Australia wicketkeeper Brad Haddin on 0, went on to score 134 off 166 balls. Ballance, meanwhile, scored a respectable 61 off 149 balls as England began to establish an impressive target. The runs didn't stop there as Ben Stokes and Moeen Ali both scored half centuries. Stokes knocked two sixes on his way to 52 and the latter scored a quick-fire 77 off just 88 balls. Mitchell Starc, who was the pick of the Australian bowlers, removed both batsmen and finished with figures of 5-114, but not before the hosts had been bowled out for an impressive 430. The 153-run partnership between Ballance and Root was vital for the hosts at a time when they were struggling to cope with Australia's quick bowling attack. Without their contribution, the result of this Test match could have been very different. Australia got off to a good start as Chris Rogers and David Warner set about chasing England's first innings total of 430. At 52-0, the tourists were cruising before Jimmy Anderson dismissed Warner. Useful scores from Steve Smith and Rogers, who was dismissed in the 'Nervous Nineties', saw Australia reach 180-3 but the visitors capitulated from there. Michael Clarke fell for 38 after an incredible catch off his own bowling from Moeen, before Ben Stokes picked up his first wicket of the series to dismiss Adam Voges. At 258-5, Australia were still in a reasonable position and, with the likes of Shane Watson, Nathan Lyon and Haddin still to bat, they will have been quietly confident of posting a decent total. However, Watson - who failed once again when his nation needed him the most - and Lyon were bowled out in quick succession and suddenly the score was 265-7, with Australia still 165 runs behind. Haddin threatened a mini revival but England's bowlers got the job done and dismissed the Australian tail-enders without much trouble. After posting 308 in reply, the tourists were still 122 behind the hosts and England were very much in the ascendency. 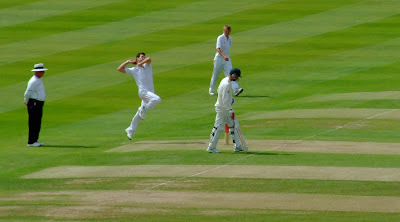 Jimmy Anderson, pictured below, took three wickets for 43 runs from his 18.5 overs. With rain expected on day five, England continued to attack Australia's bowlers on day three in their second innings as they looked to set a lofty total for the tourists to chase. Cook was disappointing again as he fell for just 20 runs before Ballance was dismissed on 0 to leave England stuttering at 22-2. Lyth contributed 37 before his wicket fell and it was once again left to Root to revitalise the innings. The Yorkshire batsman hit 60, as did Ian Bell, to improve England's score up to 207-5. The hosts were playing some scintillating cricket and taking the Australian bowlers on but something had to give... and it did. Spin bowler Nathan Lyon began to enjoy himself as the pitch started to succumb to turn on the surface. The New South Wales star took four wickets for 47 runs from his 20.1 overs, claiming the big-name scalps of Lyth, Jos Buttler, Stuart Broad and Anderson. Meanwhile, the dangerous Mitchell Johnson - who tore England to shreds throughout the previous Ashes series - bowled over 200 balls before claiming his opening wicket of the series. The hosts lost their last five wickets for just 82 runs to set the visitors 412 to win. That is a total that would be the third highest successful run chase in Test cricket history. Faced with an incredibly difficult run chase of 412, Australia set off slowly but made a steady start as Warner found his form with the bat. However, they lost opening batsmen Rogers off the bowling of Broad. Warner continued to score runs and, at one stage, there were whispers of a surprise Australia victory. However, Moeen trapped Warner for lbw and the tourists lost all momentum. Wickets quickly began to fall and, when Smith was bowled out for 33, Australia looked down and out. Captain Clarke managed to score just four runs before his wicket fell - a key moment in the clash. From there, Australia were a beaten side and lost the next six wickets for 136 runs. Moeen and Root dismissed the dangerous pairing of Haddin and Johnson before Moeen, who teased Australia's bowlers throughout the entirety of the innings, claimed the wicket of Hazelwood to send the home fans into raptures. After their second innings capitulation, there could be a plethora of changes in the Australian side with Watson's place under severe threat. The dismissal was his 29th lbw dismissal of his career and it wouldn't be a huge surprise to see him lose his place in the side. For England, however, it was the stuff of dreams and they will look to build on this success at Lord’s. Online cricket betting is on the rise as more and more people are shifting to betting on this game, because not only this sport is highly entertaining to watch and follow but it is also very simple and with very few teams. There are few tips available through online cricket betting tips and this can increases your odds of winning compared to other sports where there is just so much information to grab, that you will be definitely confused at one point in time. This is the game of popularity and you easily earn with online cricket. Many many thanks to share with us.